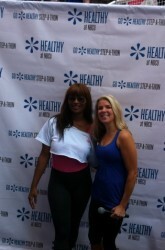 At Times Square For Healthy Week! With Season 3 & 4 winners of The Biggest Loser. With the Guys From Biggest Loser! After my workout with Toccara Jones, from America's Next Top Model. Doing Plyometric Jumps On Stage! I spent this week in NYC helping NBC Universal with their “Healthy Week” initiative. I had a great time educating the people in Times Square about health and fitness and convincing them to join me on the steps to raise money for the American Cancer Society! At the end of the day Wednesday, we reached our goal of 1 Million steps and $10,000 was donated for cancer research!Way to go NBC and NYC! I had so much fun doing workouts with Bill & Jim Germankos and Erik Chopin, winners of the Biggest Loser (pictured), the Real Housewives of New York, Cornell McClellon (President Obama’s trainer!) and Toccara Jones from America’s Next Top Model. New York (May 2011) – Cari Shoemate, Houston’s first and only celebrity fitness personality on ExerciseTV, the leading fitness digital network, will be featured in NBC Universal’s Healthy Week May 23-25 in Times Square. Cari will be leading workouts with the cast of The Real Housewives of New York, President Obama’s personal trainer Cornell McClellan and former contestants of The Biggest Loser. The event is open to the public and will take place on a set of stairs with sensors that will be counting every step. 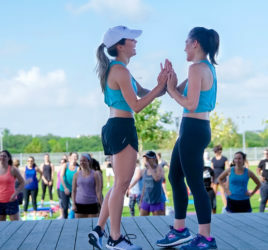 The goal for the event is to not only get people excited about fitness, but also to reach 1 million steps in order to raise money for The American Cancer Society. Workouts will take place around the structure and on the stage from 10am to 6pm each day with additional booths around the structure where the public can get healthy tips and giveaways. Coverage is taking place on E! Entertainment Television, The Today Show, Telemundo and more. Cari has over 10 years of fitness experience with certifications in personal training, group fitness and yoga. Her specialties are diverse and include marathon training, bootcamps, boxing and yoga. She spends her time training professional athletes, the Rockets Power Dancers and teaching corporate fitness to many Texan companies. Cari brings a little of her Texas charm to all of her workouts, including her ExerciseTV DVD released last year: Long Lean Legs with Cari Shoemate. She has starred in many other fitness and yoga videos, was featured in Glade commercials, has a popular blog and is a featured personality on ExerciseTV, the leading digital fitness network available in 38 million home as a free video-on-demand channel at www.ExerciseTV.tv. Cari will kick off the event on Monday at 10am by leading The Real Housewives of New York through the Step structure. At 11am she will join President Obama’s personal trainer, Cornell McClellon, in a workout. On Tuesday, she will be on stage with former contestants of The Biggest Loser, including season 4 winner Bill Germankos. Wednesday she will lead a 10am yoga class. Throughout the event Cari will be on hand to answer fitness questions and give out custom workout plans in the ExerciseTV booth located nearby at the event. Healthy at NBCU is NBC Universal’s initiative to empower millions of Americans to live healthier, happier lives by delivering health-related content across its unmatched portfolio of properties. Healthy at NBCU is NBC Universal’s unprecedented initiative to provide viewers with the information and inspiration they need to take positive steps toward better health and wellness. At a time when healthier living is among the top priorities on the national agenda, Healthy at NBCU promises to be a timely, trusted and engaging resource that will help enhance the quality of life for the over 80 million people NBC Universal touches every week. ExerciseTV is a division of NBC Universal and is a leading digital fitness network available at www.ExerciseTV.tv or in 38 million homes as free video-on-demand through Comcast, Time Warner Cable, Cox Communications, Bresnan Communications, Verizon FIOS and AT&T. ExerciseTV provides fitness videos, workout plans and healthy lifestyle and exercise tips. 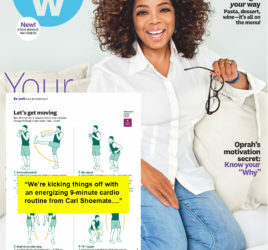 Cari is ExerciseTV’s “Expert Trainer” and is featured on their website. The event will take place Times Square on Broadway between 42nd and 43rd, in front of Walgreens . 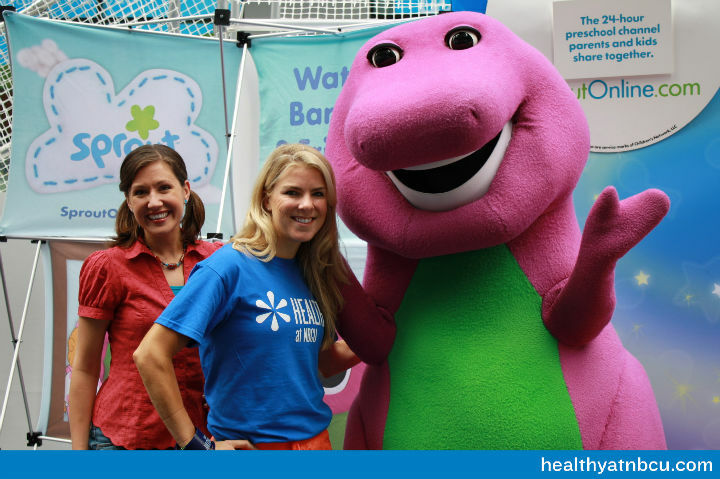 For more information on Healthy Week and a schedule of events visit www.healthyatnbcu.com/step-a-thon/ For more information on Cari Shoemate, visit her website at www.cari-fit.com.